We are steaming for home. Woods Hole, MA that is. 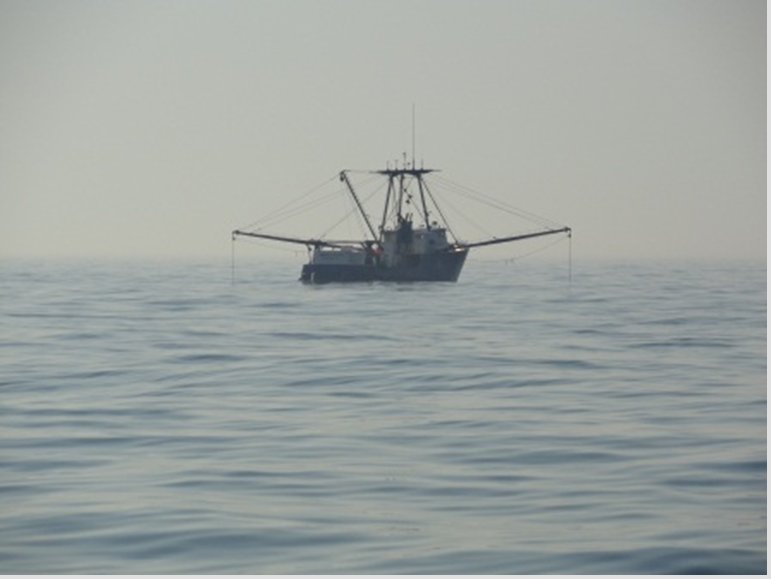 In the past ten days we have conducted 71 scallop dredge tows and processed 15, 979 scallops. We also took over 4 million images with the HabCam in 691 nautical miles of this leg. We have been a little busy. This morning (0600 hrs.) we mustered in the dry lab and began our assignments, ranging from swabbing the decks to vacuuming our state rooms. Tonight I will be in Boston and then on my way back to Minnesota. I am ready to go home, but I know I will think back fondly on a few things. The rocking of the boat when I’m going to sleep. Meals prepared for me. The sound of waves and water. The hum of the engines. Seeing what comes up in the scallop dredge. Being on deck and on the bridge. A hap chance at seeing whales or dolphins. New friends and fun banter. Even though this journey began with an unpleasant introduction, it is ending with fond feelings. Me and a barn door skate! Being on this boat has been interesting for several reasons. I have learned new things about ocean life that I can take back to my classroom as well as a few souvenirs. I can honestly say I have never seen more scallops in my life, not to mention sand dollars and sea stars! I am looking forward to sharing this experience with my family, students, and friends. As I write this last blog, I am thinking of what a privilege it has been to be a member of this team of researchers. I am honored to learn from them. To my team: Jon, Nicole, Mike, Jess, Alexis, Ted, Nick (TG), and TR, thank you!! This experience would not have been the same without you! I will remember you fondly for many, many days to come. Yesterday was a 12 hour shift of towing the HabCam. The strangely unique thing about that was the terrain. We are on the western edge of Georges Bank and the sand waves on the ocean floor are incredible! There are waves as high as 10 meters that come upon you in a blink of an eye. 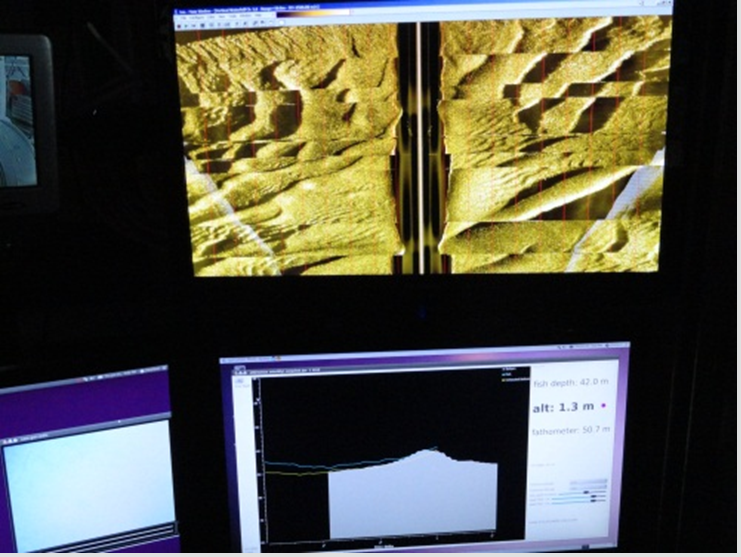 By observing the side scan sonar it looks very similar to being in a desert, or on the surface of Mars. We refer to driving the HabCam through these areas as piloting the “White knuckle express”. To get through these areas Scott was able to use geographic images collected by the United States Geological Survey and created an overlay of the pictures onto our tow path, alerting us to any possible hazards in navigation. This data allowed us to anticipate any potential dangers before they arose. We continue to see skates, various fishes, lobsters and sand dollars, and in places, huge amounts of scallops. The images will be reviewed back at the lab in Woods Hole, MA. I have been able to see some of them and the clarity is amazing. Today, we are continuing to tow the HabCam. 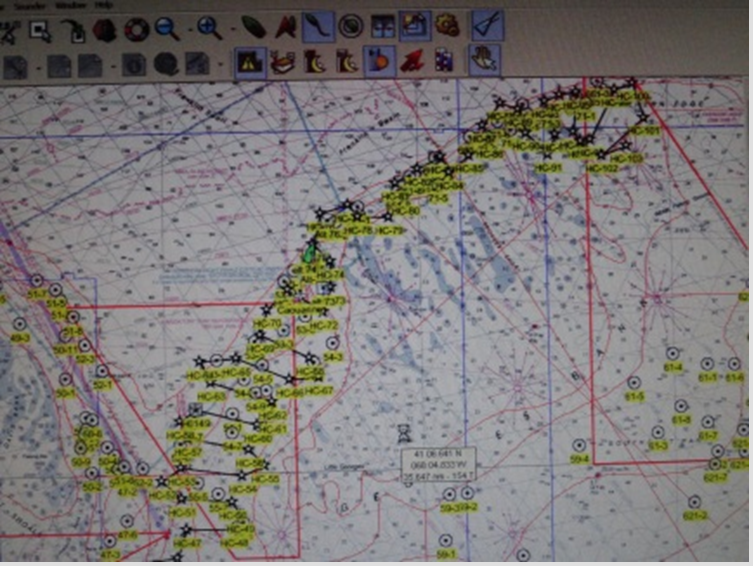 When finished, we will have taken images from hundreds of nautical miles with over 4 million images taken on Leg II! We will put in the scallop dredge toward the end of my shift. We will then conduct back to back dredge tows on the way back to Woods Hole totaling over 100 nautical miles for this portion of the trip. Yesterday was a beautiful day at sea. It was, however, strange. 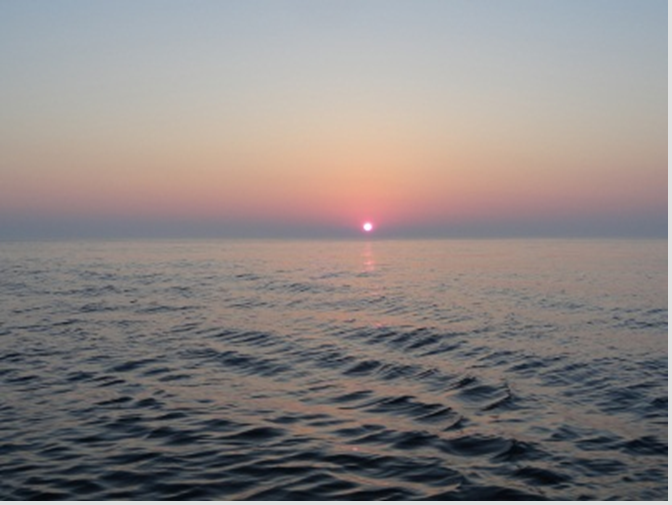 The sea was really calm and the sun was shining in a big beautiful sky. The strange thing was that about 300 yards out was fog. There were many commercial fishing vessels all around us. It felt like being in an episode of “The Twilight Zone” or some creepy Steven King novel. I am thankful, however, for smooth sailing. The crew continues to be awesome. We had flank steak and baked potatoes for supper last night. Lee, our chef, is amazing. Everything she makes is from scratch and there is always plenty. The only reason someone would go hungry on this ship is if it was by choice. Lee takes very good care of us! 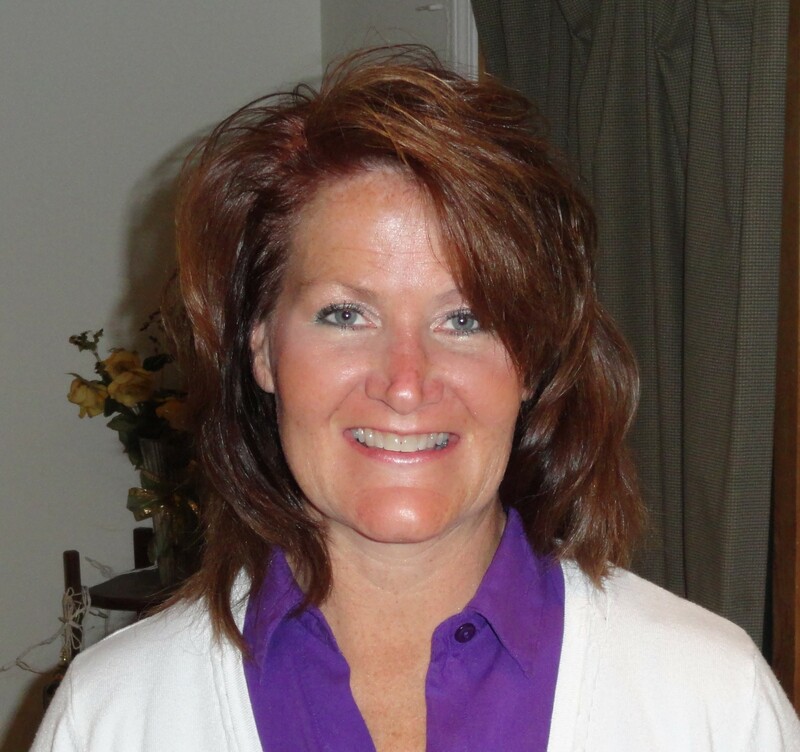 I have had ample opportunity to get to know others who share my shift. Mike, Jessica and I are science volunteers. 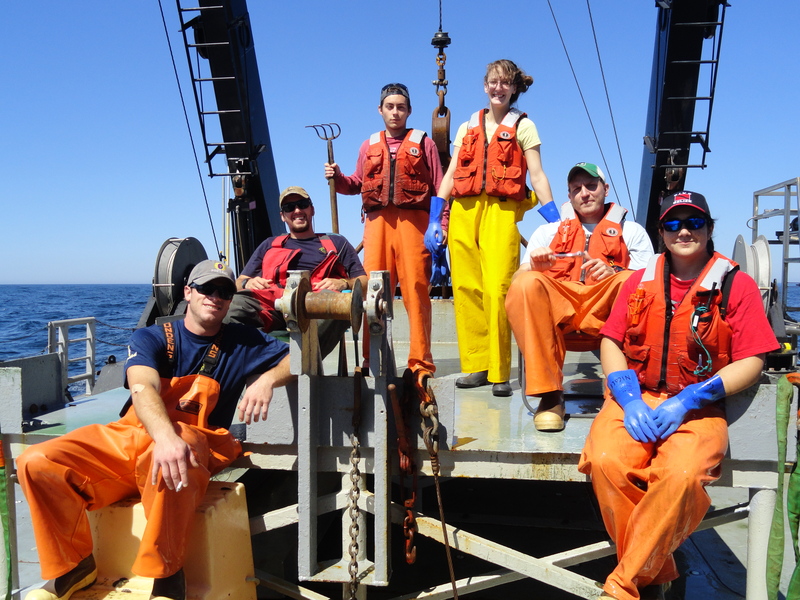 Jon and Nicole are the NOAA staff along with Scott an associate scientist at WHOI( Woods Hole Oceanographic Institute) on the science team. We get along “swimmingly” and have fun banter to break up any monotony. I am sleeping very well at night. I think it’s the rocking of the ship that lulls me to sleep. I think I will miss that when I get home. Funny, how at the beginning of this journey I was cursing the very waves that now rock me to sleep. The way the body adjusts is amazing. I will be home in four days. This week has swiftly gone by. Although I miss home, I feel I will miss people from this ship and the experience of being at sea (minus the sickness!) My mind is already putting together science lessons for my biology classes this fall. I do, however, have three full days left on this ship and I plan to make the most of it. 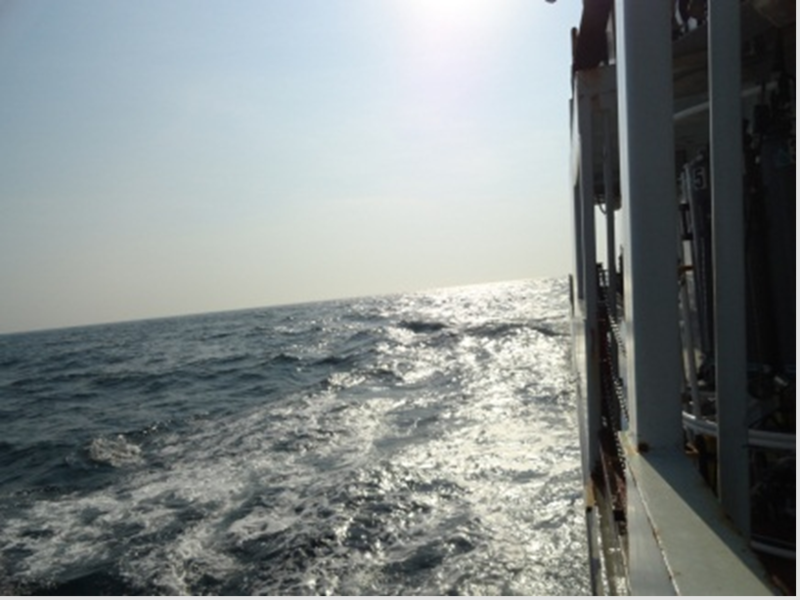 Keep checking the blog to find out what happens next on the great adventure in the North Atlantic Ocean! I came on shift yesterday at noon with three back to back dredge tows (we have done 30 dredges thus far on Leg II). We are off the coast of Long Island. Most of the dredges around here have been filled with sand dollars and sea stars. 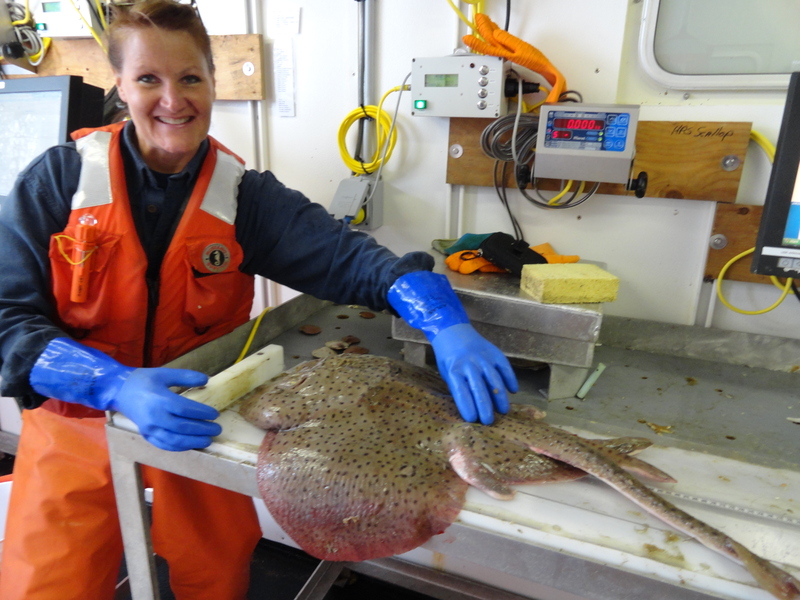 In total, we have processed and counted on this leg of the survey 5, 366 scallops, 453 skates, and 58 Goosefish, a very interesting fish that buries itself in the sand and uses a filamentous lure to attract prey and engulf them. In addition, we have counted 132, 056 sea stars (wow!) and 590 crabs. The HabCam had some glitches yesterday but we began running the vehicle on our shift at approximately 1245 hrs. It made a run for approximately three hours and 57 minutes, with approximately 22.387 nautical miles of pictures before we dredged again. While looking at the images of the HabCam, it astounds me at seeing prior dredge track marks from commercial scallopers and clamers. By looking at the side scan sonar, some of the dredges are very deep and very invasive. It reminds me of strip mining and clear cutting in terrestrial ecosystems. It is also evident, by observing the images, that little is left in those areas but shell hash. With that said, there are still some interesting species that get photographed, such as jelly fish and sea stars in patterns you would think they orchestrated. We are working our way toward Georges Bank and will be there, from what I’m told, sometime late this afternoon or evening. All equipment is running well and what time we lost with the late departure has mostly been made up. It’s amazing what technology can do! As of yesterday, I have been away from home with little to no contact for six days, so when I was told yesterday morning prior to coming on shift that we had cell phone signal, I immediately went up on deck and called my husband! Although I only got an answering machine, it was good, and familiar, to hear his voice. We then had a fire drill at noon and after that, set to work. It was nice to be outside working for the next 4 hours. I think I finally have my sea legs. However, the seas have also been cooperating with only 1-3 foot swells, at best. When they are higher, I sometimes feel like the Scarecrow in “The Wizard of Oz”. It’s a good thing I can laugh at myself when I look completely ridiculous while tripping through a door or, with no warning whatsoever, bump into a wall! From what I understand, this ship has a flatter bottom than most so every wave and swell catches it and tosses it in whatever direction that wave is going, despite having just gone in the opposite direction! I am hoping the sea remains calm when we get to Georges Bank. I am learning a great deal about the critters that live in the ocean around here. It is so strange to have at times hundreds upon hundreds of sand dollars being pulled up in the dredge at one location and then to have mostly sea stars pulled up at another location. My favorite, however, are the hermit crabs! They are so cool! They will begin to crawl out of their shells, see you coming to pick them up and immediately crawl way back inside and stare at you. I actually think I saw one blink at me. Not really, but my imagination does run away at times. Those are also the times someone, usually me or the watch chief (chief scientist is guilty of this too! ), bursts into song or starts quoting a movie line, and then half the crew is joining in. 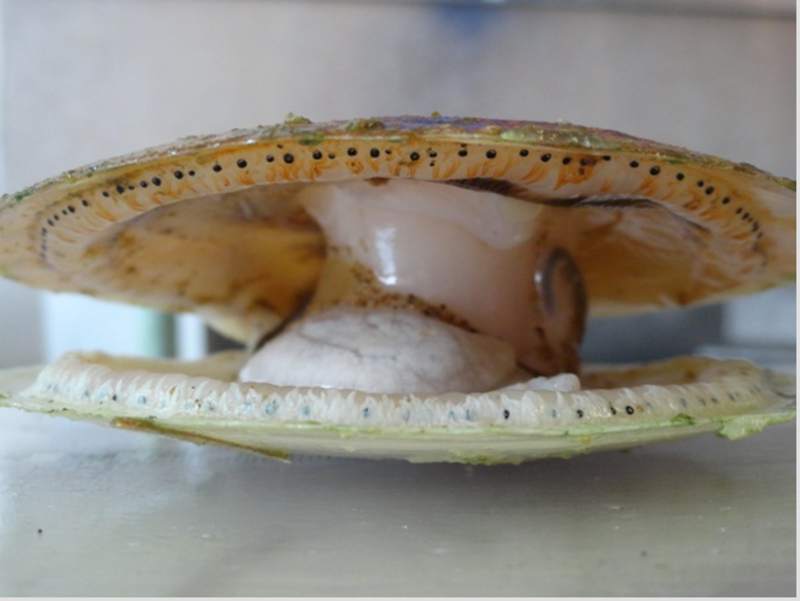 I have gotten more proficient at using the technology equipment on board that does the recording of the measurements of the specimens, and also at cutting/shucking the scallops. Never thought I would know how to do that! I have a feeling there are a few things I never thought I would do before this cruise is over. I have five more days at sea. Anything is possible! Side note: Today is beautiful for being at sea! Clear sky, moderate winds, and sea legs that are working!! Current time: 1630 hours. We have been operating the HabCam since I came on duty at 1200 hours. It is interesting watching what the HabCam is flying over. Depending on the area, it might be littered with sea stars (a predator of small scallops) or it may be littered with hundreds of sand dollars (a food of ocean pout – ugly looking fish). In the case of sea stars, you won’t see many adult scallops, which, makes sense if the young ones are getting eaten. All in all, the research here is pretty straight forward. 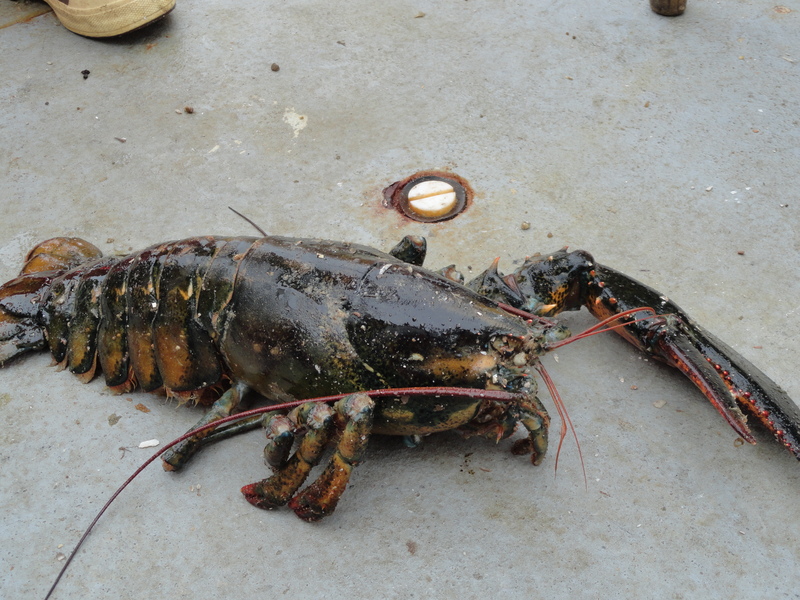 We are looking to see what predation is affecting the scallops, basically, food chains and habitat. On the side scan sonar, you can see past dredge marks from fishing vessels that have come through. We have passed over some old fishing nets, gear, a shoe, a can, odd things like that. I have been “flying” the HabCam which is pretty cool. You need to keep the cam approximately 2.5 to 1.5 meters off the sea floor which can be a tricky thing to do. Fun, but tricky. While the cam is flying, the “co”pilot” is scanning images looking for various critters, specifically scallops. It can be a process that makes your eyes go buggy after about 1/2 to 3/4 hours so we switch off every now and then. This specific episode of the HabCam has been running for approximately 14 hours and has traveled about 177 nautical miles. That is a lot of sea floor!! 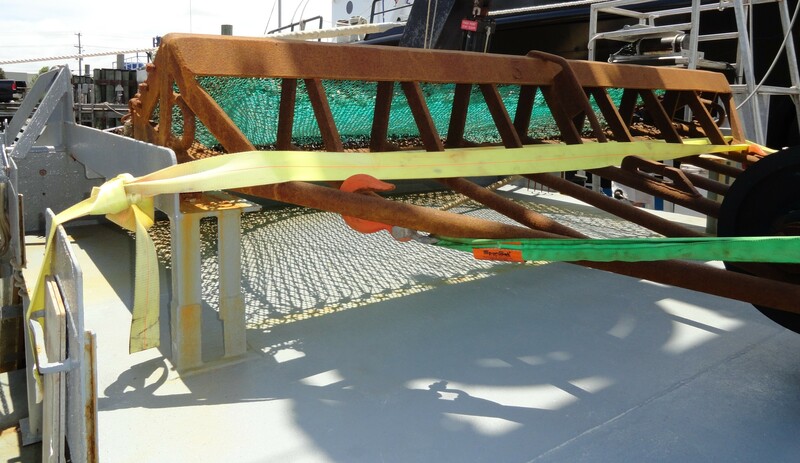 In approximately 35 minutes we will deploy the scallop dredge. The dredge will run for 15 minutes spurts. We will run six of them back to back. 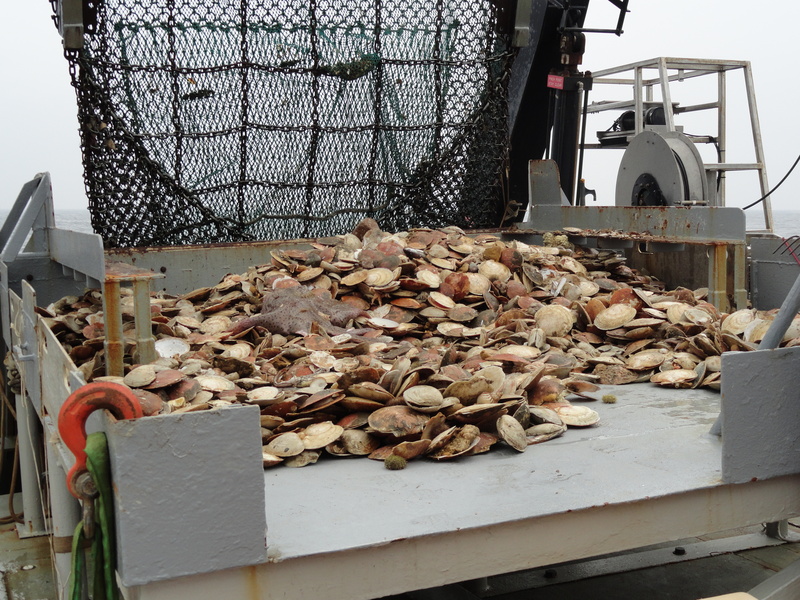 When the dredge comes up we will sort all the species into their buckets, count and measure the scallops, count and measure the fish, toss back the sand dollars, star fish and most often the crabs. The scallops that are two years old or younger we measure and toss back into the sea. The older scallops get measured, sexed, weighed and sometimes shucked. Word is there will be scallops for supper! I now understand what it is like to be in a washing machine with no end! I have not been able to blog prior to now because I have been spending a great deal of time in my bunk and in the head. My diet consists of saltine crackers and water. Occasionally, I can sneak in a piece of fruit, but not often. So far, this experience has not really begun yet. I have, however, been able to go 24 hours with no loss of stomach content. That’s a good sign, I hope. Sleep has been good and I feel rested (for the most part). 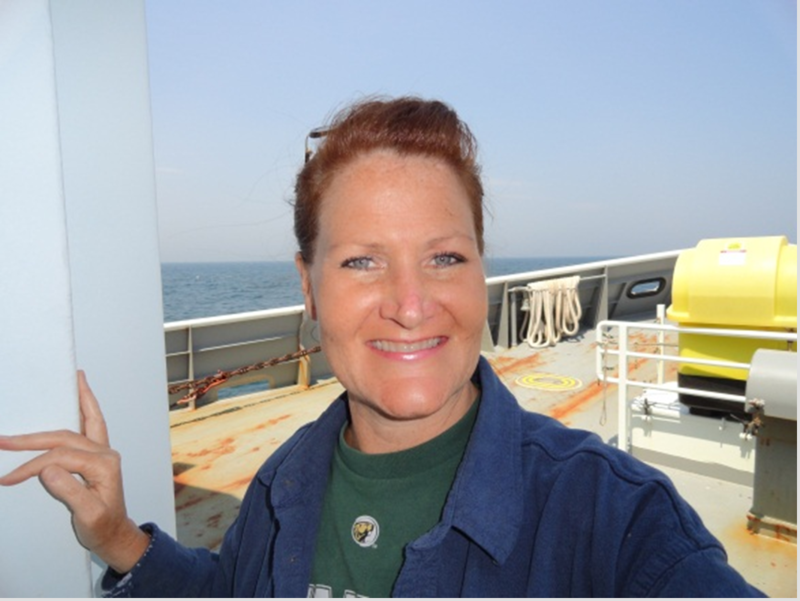 The crew on the ship is awesome and I could not ask for a better chief scientist! Everyone was very understanding when I was sick and cut me slack for not being able to pull my weight. I think the crying helped soften them up. I was looking forward to big seas and water, not so much any more. I beg for calm seas and light winds. Perhaps I will be able to get some photographs of me working for the next blog, but until then, I will be happy with just keeping my lunch down!